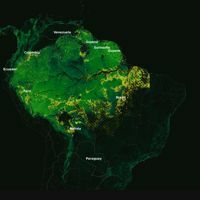 Rising Voices is pleased to announce the launch of its Rising Voices Amazonia Microgrants! We will be awarding up to six micro-grants up to USD $3,500 to projects with a strong and clear idea for how to utilize participatory media tools to tell the story of issues important to them. To apply, please visit the “Submit a Proposal” page in Spanish or Portugese, where you will find short questions that will help you outline your project plan. Crowdsourcing Helps Bangladeshi Students Read With Their Fingertips – Banglabraille is a new project using Unicode and crowdsourcing techniques to create textbooks for tens of thousands of visually impaired students in Bangladesh. Off to Burkina Faso! The Niger Team OpenStreetMaps their way to Ouagadougou – The 2013 Rising Voices’ micrograntee Mapping for Niger is continuing on with their work, traveling around their region to meet with other OpenStreetMap teams and learn new skills. Building the Handheld Revolution in Closed Communities: Mycitizen.net – A guest post by the creator of Mycitizen.net, a free and open-source platform that facilitates social networking in local communities. Designed for Burma, it can be used where the safety of civil society actors requires special privacy protection. Senior Citizens Write Wikipedia – Breaking down barriers to technology is the first step to involve society's most experienced members. This Czech Wikimedia Foundation project will involve seniors in the online Wikipedia community. 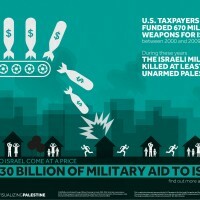 An infographic from Visualizing Palestine – check out our blog post for more. 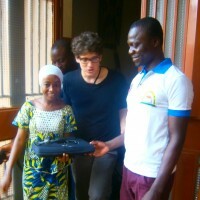 Mapping for Niger team travels to Burkina Faso for an OpenStreetMap meetup and is awarded a computer – more on the blog.